A Saskatoon native transplanted to the Niagara Region of Ontario, Suzie Vinnick is the proud owner of a gorgeous voice, prodigious guitar and bass chops, and an engagingly candid performance style. Her career has seen triumph after triumph. Among her most recent successes: being nominated for a 2018 Canadian Folk Music Award for Producer of the Year with her co-producer, Mark Lalama. Suzie achieved finalist status in the Solo/Duo Category at the 2013 International Blues Challenge in Memphis, TN; received the 2012 CBC Saturday Night Blues Great Canadian Blues Award and the 2012 Sirius XM Canada Blues Artist of the Year. Suzie has won 10 Maple Blues Awards (she has been nominated for 22 so far! ), won the 2011 Canadian Folk Music Award for Contemporary Vocalist of the Year and is a 3X Juno Nominee. 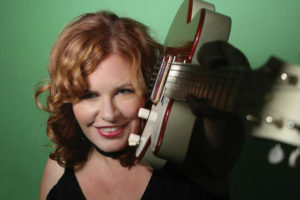 Suzie has toured nationally with Stuart McLean’s The Vinyl Café and the John McDermott Band, and performed for Canadian Peacekeepers in Bosnia and the Persian Gulf. She was also the voice of Tim Horton’s for 5 years. Suzie has just released her latest album, a full-band roots and blues extravaganza entitled Shake The Love Around.